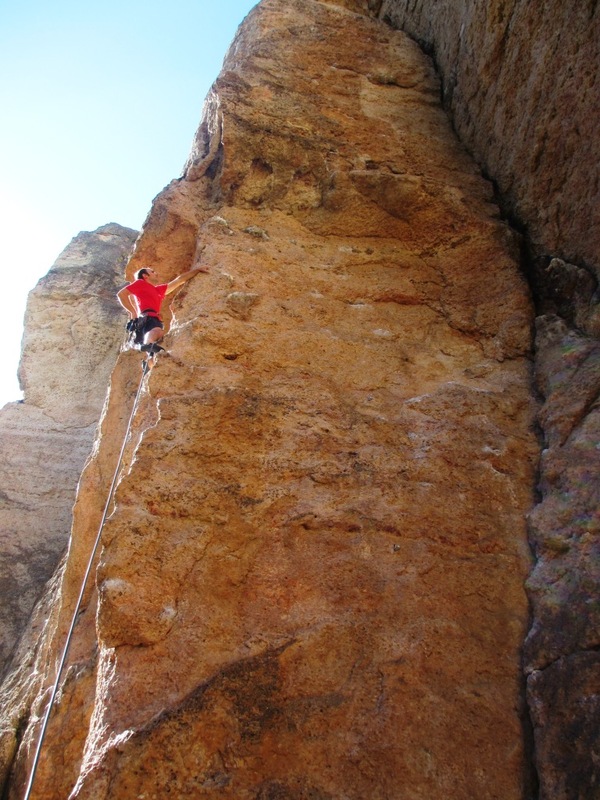 It was a long, hot summer on the Colorado Front Range, so after a seemingly interminable climbing drought the family was fired up to head north and check out the latest rage that is Ten Sleep Canyon. We’ve had lousy luck when it comes to Ten Sleep. I first bought the guidebook in the Spring of 2007, with plans to head there that coming summer. I developed a curious Sesamoid injury (that’s in your foot) that was mis-diagnosed as a stress fracture, so I spent that entire summer in a walking boot, meaning Ten Sleep would have to wait. I don’t exactly recall our excuses for the next four summers, but to sum up, each year we made firm plans to go to Ten Sleep, each year those plans fell through, and each year the new edition of the Ten Sleep guidebook doubled in size. The French Cattle Ranch, its just like France! So you can imagine my surprise when we finally rolled through Ten Sleep Canyon early on Friday morning. My objective for the trip was my friend Matt Wendling’s brilliant “Sky Pilot” and the recently tacked on extension at the aptly named “French Cattle Ranch”. The highest compliment we can bestow on an American limestone crag is to compare it favorably to France. This has been a running joke between me and Kate for literally ten years, when we first began exploring the limestone crag of Palomas outside of Albuquerque. During one of our first visits we met some friendly chaps from Durango that had been lured several hundred miles to our humble bluffs by the dubious claim that it was ‘just like France’. But the Sector D’or et Bleu really is just like France–except that France has a lot more routes and the crowds to go along with them. Not to worry, with five 5.14s, as many 5.13s and a number of projects, there is plenty to keep you busy. The rock is beautiful pocketed stone, overhanging at barely 5 degrees, involving extremely thin, tweaky and technical climbing. I imagine this is what the hard routes at Buoux are like: invisible footholds, half-pad monos, and calf-straining in their continuity. Kate warming up on Tutu at the FCR. After a fun warmup on the popular Tutu and the diminutive Lil Smokey I put two burns into my project. To be honest I was a bit dismayed by the continuity of the line. I hadn’t done a lick of Power Endurance training in almost a year, and I was assuming the hard lines here would have short, bouldery cruxes with lots of rest like the lines in Lander. Although my power was as good as ever, I didn’t fancy my chances of stringing together so many hard moves in only three climbing days of work. Wendling’s original vision ends at what is currently the 9th bolt, and it was all I could do to suss the moves to that point on my first go. The next burn was dedicated to figuring out the newer 4-bolt extension. I had decided to gamble and go for the whole enchilada, accepting that the effort expended working the harder finish may sabotage my chance at sending the easier original pitch. I was able to work out all the moves, but they seemed unlikely to coalesce in such a short period of time. After a long day of driving and climbing we headed in to Ten Sleep to explore the dining options. Or should I say option. I hear Ten Sleep is a bustling tourist town in the summer, but by early October the show has moved on. The only establishment still open was the Ten Sleep Saloon, which fortunately had a diverse menu (the Carne Asada burritos I ordered were outstanding). The real shock was that there was not a single grocery store in the entire town. We had never even considered such a possibility. We had enough power bars to get us to the summit of Everest but we had no real food. A quick stop at the Pony Express convenience store lead to a brief panic attack at the thought of eating rotisserie hotdogs and HoHo’s for the next four days. We were extremely elated to discover that full-service Worland was only 25 miles further west down US16, and made plans to visit first thing the next morning. I’m a big advocate of rest days, primarily for injury prevention, but also for the plain fun of it. The great sport crags of America all seem to be in the middle of nowhere, and it turns out there is a lot of fun to be had in such places. We were psyched to explore a new venue. 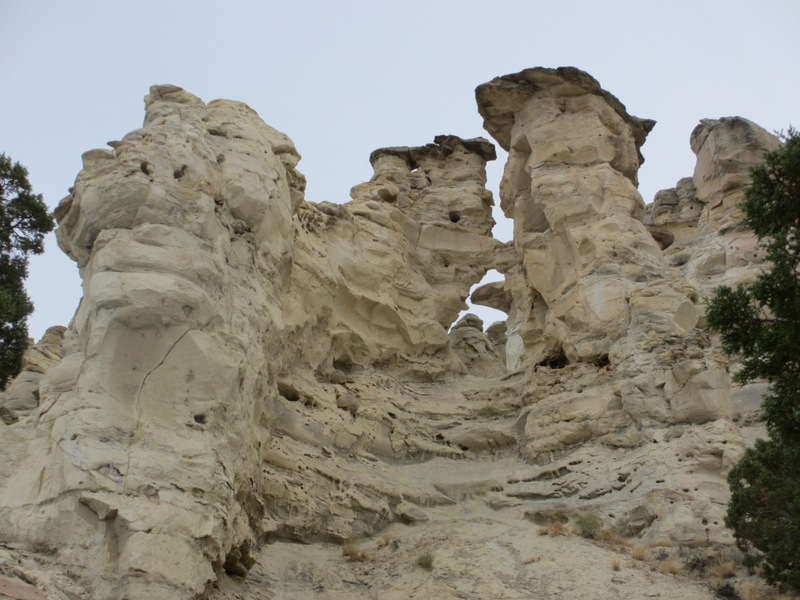 We headed out to find Castle Gardens, somewhere in the badlands between Ten Sleep and Worland. I managed to get us lost literally within 100 yds of turning off the highway, but after a twisting 20-mile detour we found the clearly posted sign pointing the correct route. 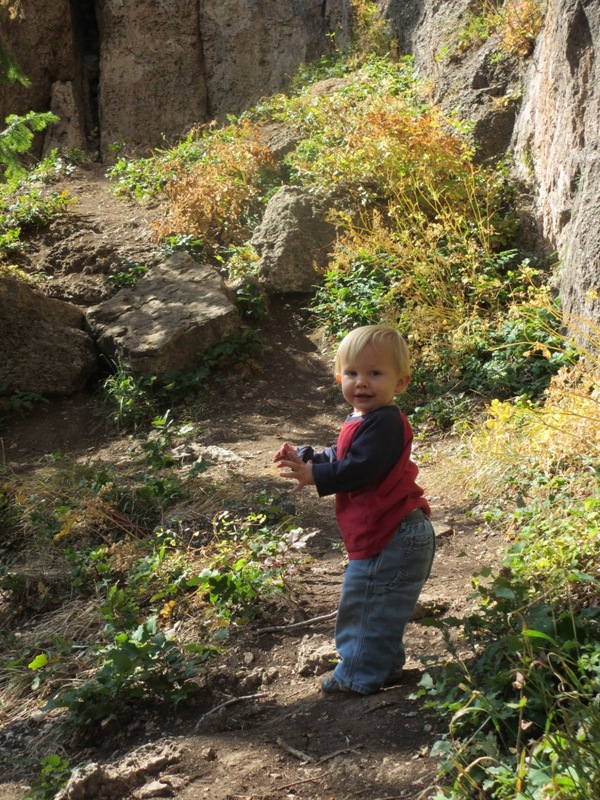 The Gardens are formed by gnarled hoodoos of Mesa Verde Sandstone and were a big hit with Logan. My favorite rest day activity is staring at rocks, so after a grocery stop in Worland and an afternoon nap for Logan we headed up Ten Sleep Canyon to check out the seemingly unlimited supply of Big Horn Dolomite. Far too much for one rock-staring session, so we planned to focus on the right half of the Mondo Beyondo cliffband. The Slavery wall looked amazing, stacked with fun, steep lines and beautiful marble-streaked stone. We passed countless tempting lines along the hike, and lots of friendly climbers taking advantage of the cool evening temps. The next crag to take my breath away was the Superratic Pillar, which lives up to its billing. This crag also hosts a number of hard lines, but I was disappointed to see an obviously drilled pocket on “F’d in the A”. I think its pretty sad that chipping is still taking place in this day and age. I’d like to think that as a community we’ve learned from the short-sighted mistakes of the past. Anyway, enough ranting. Two lines here really caught my eye, “Hellion” and “He Biggum….”; I would love to return for these routes some day. The next order of business was to find a good crag for warming up. Logan is right at the age where he can walk like a champ and is starting to run–on flat, level ground. Not much of that at Ten Sleep, so it was a real challenge to find crags where he could cruise around unsupervised. By dumb luck the Sector D’or et Bleu was just such a crag, but there weren’t many good warmups there. And frankly, Ten Sleep’s best-selling point is its plethora of delightful 5.10s and 5.11s. We wanted to sample as many as possible during our short trip. So we continued along the cliff to the far end of the FCR in search of crags with a nice flat base for worry free toddling. The Big Kahuna Pillar had just what we were looking for, and a new cliff, the aptly named “Whiny Baby Wall”, though not ideal, was serviceable with a creative belay strategy. “Racing Babies”, an airy arete at the BIg Kahuna Pillar. With temps nearing 80 degrees in town, we decided to wait till the shade arrived to start our next climbing day. 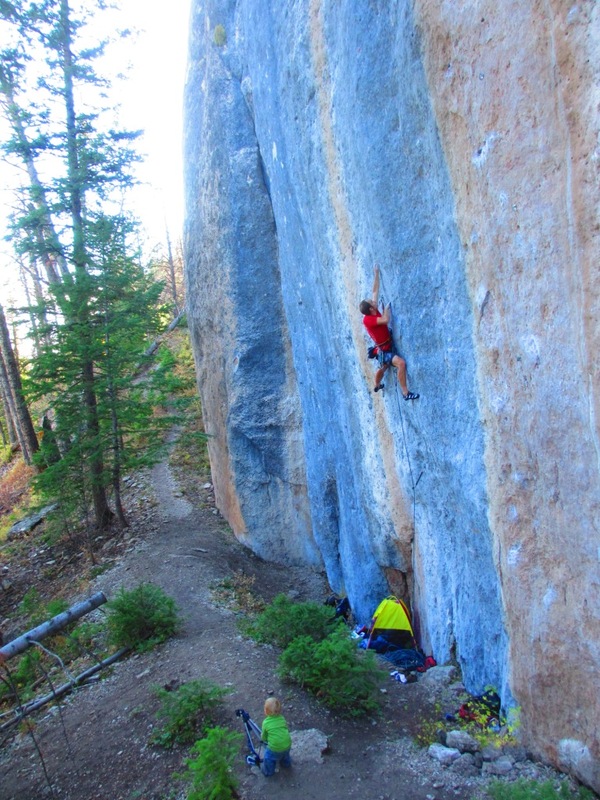 This strategy backfired when Logan began falling asleep on the short drive to the crag. 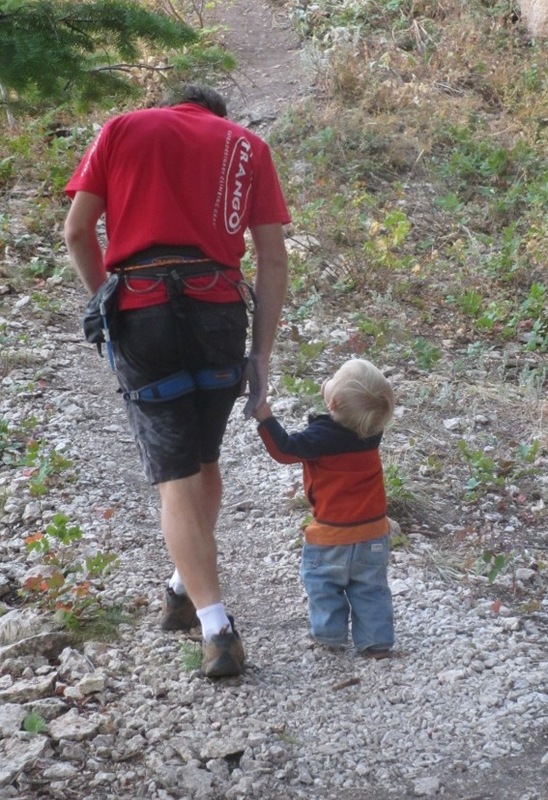 Logan takes one nap per day, and that must coincide with climbing to get the most out of the crag day. We knew if he fell asleep he wouldn’t take another nap, so we rolled down the windows, started tickling him, singing songs, and generally driving like maniacs to get us to the cliff before he went down. Fortunately he brightened right up once it was time for the approach hike, and he took a nice long nap as soon as we got to the crag, allowing us to climb two stellar 5.10s and a nice 5.11 at Sector Shinto. I was able to get through the redpoint crux on my first attempt of the day on Sky Pilot, but I couldn’t get decent recovery at the mid-point rest. I was able to fight through the growing pump for a few more bolts but eventually grabbed the last draw to forfeit the battle. Normally I would beat myself up over such an act, but I hesitated for quite a while to consider the situation before throwing in the towel and I think it was the right call. Falling while clipping is not an acceptable option in my opinion. No single burn is worth getting hurt over. After a nice long rest I was able to put some good work into the crux sections and find some slightly better rest stances, hinting that I might have a shot at this thing after all. Unfortunately the slow building pump took so much out of me that I was pretty much shot for the day. I gave it another go but it was over almost as soon as it started. Finishing up the entrance exam of Sky Pilot while Logan naps below. Sky Pilot is in your face from the get go, with long cranks off a pair of tight monos that feel more like finger locks. This time slapping for the marginal rest jug seems relatively routine. Not really pumped yet, so no need to shake, except my left middle finger tip is numb from the mono-lock. 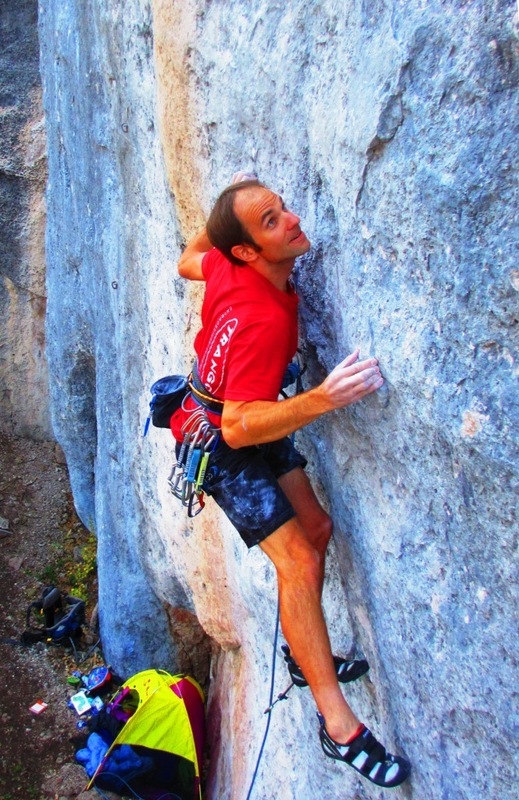 After a few chalk cycles I step up to an awkward pod and execute a gymnastic traverse that leads to the redpoint crux. A big stretch to a shallow sloping two finger pocket spit me off twice on redpoint. 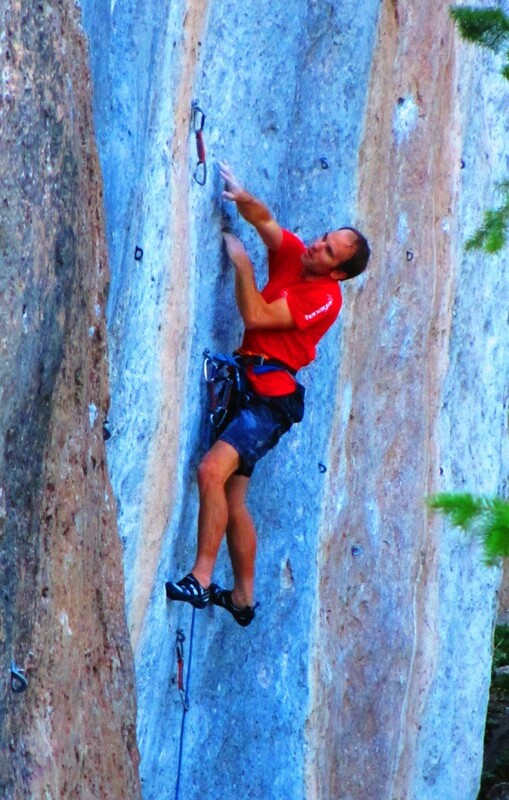 Getting the pocket isn’t so bad but the hold is so smooth its very difficult to dead hang, let alone pull past. As luck would have it, the otherwise plentiful footholds suddenly vanish right at this point, making the move downright desperate. My solution is a tiny foot chip–really, a calcite stain–less than half a millimeter deep. Fortunately I have a brand new out of the box pair of Tenaya Inti’s. 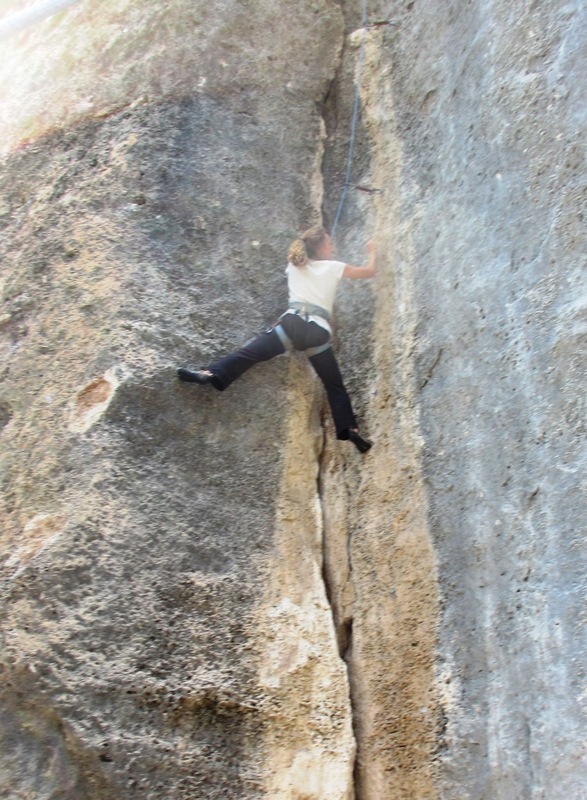 Beginning the traverse with a big cross to a two-finger pocket. Today is the hottest day of the trip, and with a 6+hour drive still on the agenda, there is no time to wait for cliff to cool off. The pocket feels as slimy as ever, and I’m nearly certain this will fail, but I stick to my beta and pop my left hand to a miserable sloper, followed immediately by the right hand to another sloper just above the pivotal pocket. Amazingly I’m still on, so I cruise to the route’s one truly good shake and set up camp. Literally 10 minutes pass, including a super-not-recommended T-shirt removal episode that thankfully provided slight relief from the oppressive heat. I can feel myself passing the point of diminishing returns and decide its now or never. A big high step leads to a three-finger crimp, a shallow 2-finger dish, and a marginal shake in a shallow scoop. This rest is a trap, so I shake only long enough to clip, chalk up, and rehearse the ensuing boulder problem in my mind. Match the last good pocket, work the feet up. Right hand: half-pad mono. Step up, lock off mono to right shoulder. Hips right, left hand windmill to two-finger chip. Stand up tall, belly to rock, stab right hand to half-pad mono; precision is key. Bump left foot. Breath. The jug looks too far. “Watch me!” Dyno to jug…. That’s all for now, but we will be returning to Ten Sleep soon…. It doesn’t happen very often, and perhaps that’s what makes it so sweet, but sometimes, everything just works out perfectly.